We all know the feeling – the early afternoon drowsiness that seems to creep on you after lunch. This is not an uncommon occurrence in the workplace and is completely natural. Every afternoon, your body’s biological clock sends signals to your brain that it is time to get some sleep. This coupled with unhealthy lunches and lack of a good night’s sleep creates the ‘post lunch slump’. During the post lunch slump, productivity in the office can decrease drastically. Often times, workers will feel sluggish and less aware which results in little to no work getting done throughout the rest of the day. But, what can be done to prevent the dip of productivity after lunch? We have the answer for you. Here is a list of five ways you and your team can avoid the post lunch slump. 1. Watch What You Eat There is a strong correlation between productivity and what you put in your body. If you are the type to skip breakfast and load up at lunch or eat fast food, you are most likely going to experience the post lunch slump. Skipping breakfast deprives your body of the energy it needs after going a full eight hours without nutrients while you sleep. As the name implies, you need to ‘break the fast’ to get your body up and running again. Eating a large and/or unhealthy lunch can also slow you down. In a study done by the National Sleep Foundation, eating a large meal or a meal comprised of simple sugars and carbohydrates results in a spike in glucose, which in turn leads to your body feeling heavy and sleepy. To avoid this, it is important that you eat a healthy lunch filled with complex carbohydrates and protein. This includes foods like green beans, lettuce, avocado, tomatoes, whole wheat, eggs, chicken, and more. Foods like these are lean and high energy, giving you the extra boost you need in the afternoon. Also be careful of over eating. Large lunches take more effort to digest, which attributes to the drowsiness you may feel after a large meal. Instead, eat a smaller lunch and try to supplement it with healthy snacks throughout the day. 2. Curb the Caffeine Coffee is amazing. It helps improve to alertness, can be customized to your liking, and tastes great. But, too much of it can become a problem. The more caffeine you consume, the more it will take for you to feel awake. Too much caffeine can lead to problems like insomnia, irritability, stomach pains, fast heartbeat, and caffeine addiction. So, rather than drinking another cup of coffee after your lunch break switch to decaf or non-caffeinated drinks instead. Even better, make the switch to water. Did you know that even mild dehydration (1-3% of body weight) can cause to impaired brain function and reductions in memory? Dehydration can cause frequent headaches, irritability, and impaired concentration; factors which can lead to a very unproductive day. Being properly hydrated throughout the day will help prevent these symptoms and side effects, and ultimately lead to a more productive afternoon. 3. 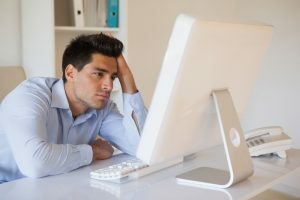 Exercise Sitting in front of your computer for long hours can result in drowsiness and boredom, and after lunch this feeling is amplified. Rather than slumping over your desk, try going outside and get some exercise. Walking around in the fresh air for a few minutes is a great way to get your blood pumping and fight off fatigue. If you cannot find the time to step outside, take a short trip to the water cooler or around the office instead. 4. Get Enough Sleep On average, adults need eight hours of sleep to function properly. Not getting enough sleep can lead to having day time fatigue, making it even harder to get through the post lunch slump. Having a consistent sleeping schedule will help to get your body used to sleeping and waking up at certain times. Also, incorporating sleep friendly habits before going to be can help improve your quality of sleep. Be sure to stop using electronics at least one hour before going to bed and try to make your mornings stress free by laying out your clothes for the day or preparing your breakfast and lunch the night before. If you are able to, try to take a power nap during your lunch break. A short 10-20 minute nap can be enough to refresh and rejuvenate you. Be sure to keep these naps short, anything longer than 20 minutes can leave you feeling groggy and drowsy. 5. Work Smarter, Not Harder To make the most of your work day, be sure to not save all of your work until the end of the day. Plan out all of the tasks you have for the day and create a schedule or to-do list for the day. Try to do all of the important tasks during the hours you are the most productive. After lunch, give yourself some time to finish off some smaller tasks or whatever work you have left from earlier in the day. This way, you are not saving all of the important work until the end of the day and panicking when you do not finish. Rather than spending your afternoon wishing you were napping instead of work, take steps to ensure your time is spent productively. Start off with little changes like preparing your lunch the day before and build to things like cutting back on the caffeine. Just taking a few steps in the right direction can have a positive effect. So, what are you waiting for? Make these changes and take your afternoon back. Emplicity understands that HR Outsourcing should be simple and meaningful. As a Professional Employer Organization (PEO), we strive to be a great partner in supporting your business. If you would like to request more information on how we can assist your needs, please reach out to us at 877-476-2339. We are located in California serving the Orange County, Los Angeles, and the greater Sacramento and San Francisco areas.